During this workshop I will teach you the basics of felting and how to cover an olive oil base soap with pure merino wool of different colours to create your own original felted soap, which you will then take home with you. A great way to spend a morning or afternoon with a group of friends or to celebrate a birthday or other special occasion. Olive oil soap is highly moisturising and a natural antioxidant rich in vitamin E. It has no parabens or animal fats. It provides a really luxurious cleansing and caring experience for your skin. The merino wool you will cover it with is organic, antibacterial and antifungal. Each bar is then wrapped in a soft, lightly exfoliating and invigorating washcloth, which at the same time protects the soap making it last much longer. 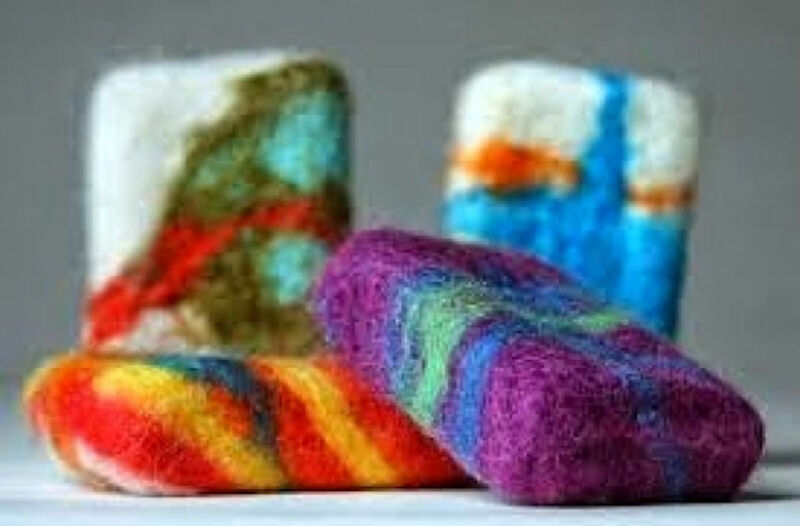 As well as cosmetic qualities, felted soaps also have ornamental value. They look great in any bathroom, in the shower or by the sink. As the soap gets used up, the wool shrinks with it and at the end you are left with a small hollow pouch which you can use as a pendant or brooch or you can fill it with lavender or other herbs to place it inside drawers or wardrobes or as a decorative air freshener. Please, email me at susana@suhzo.com if you are interested in booking a workshop for your group. You can also sign up to my list, so that I can keep you informed by email of my scheduled workshops.